The 23rd edition of the Mosonshow is about to take place on the 27th and 28th of April. 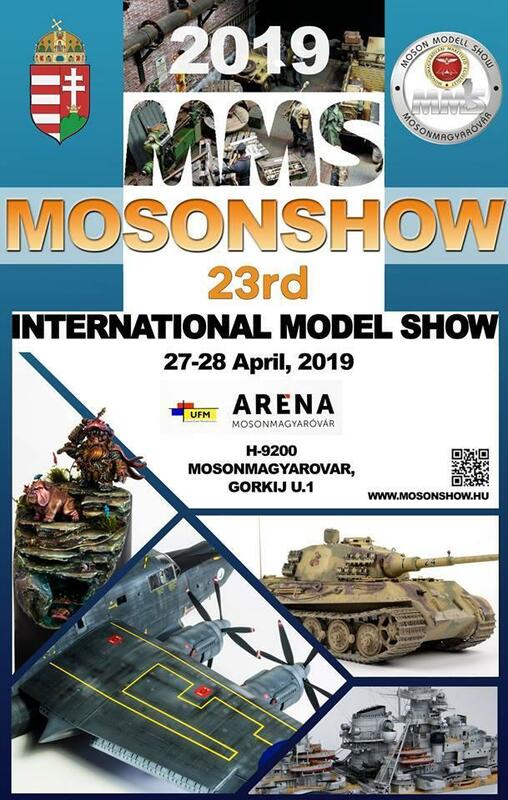 As the largest scale modelling event on the European continent, Mosonshow has become a focal point and a “must go” for many modellers – as last year’s numbers show: 2,315 models, 66 categories, 881 contestants, 35 countries. And these countries not only included mainland Europe, but also places like Taiwan, Israel and Australia, making Mosonshow a truly international event. Mosonshow’s core is of course the competition. This year, 67 categories are waiting for the contestants, and it is safe to say we are going to see more than 2,500 models. The competition takes place in the UFM Arena, a sports venue close to the town’s centre. For this year, 144 square meters’ worth of tables are allocated to the display of competing models, while another 17 meters of table length are dedicated to figures and busts. This space is filling up fast, and two weeks before the event more than 1,400 models from almost 500 modellers have already been pre-registered! This will save you a lot of time and make the registration process a lot smoother (and you’ll save 50% off the registration fee). Also, if you plan on bringing your model(s) on Friday, you might want to come a bit later than 4pm, after the first wave of registrants has ebbed. The ground floor also hosts the club displays with another 50 meters of tables. UFM Arena’s top floor and gallery is filled with vendors and manufacturers – and because this space is not nearly enough for the number of participating vendors, many of them open shop in a high school next door. The Kossuth Lajos High School is located a mere 50 meters from the Arena, and its class rooms and hallways become a regular modeller’s shopping mall during this weekend. All the big European names will be here, like Eduard, Aires, Ammo by Mig etc., but no less interesting is the multitude of small manufacturers, offering everything from resin parts to decals and tools. So far more than 100 vendors are confirmed! Finally, Mosonshow prides itself in offering workshops for all kinds of modelling topics, and this year will see workshops by, among others, Mike Rinaldi and Marcus Nicholls. How to Get There? Where to Stay? The town of Mosonmagyaróvár (invariably shortened to “Moson”) lies close to the Hungarian/Austrian/Slovakian borders, roughly 80km from Vienna and 35km from Bratislava. For most international visitors, a flight to one of these two cities and a short train ride will be the most convenient way of getting there. Moson itself is a small town of about 32,000 people, a lovely town centre, and a castle right next to it. The town offers lots of restaurants and cafés, making it an ideal place for socializing with fellow modellers. Moson and its surroundings offer a bunch of hotels, many of them spa-like. Still, with thousands of international visitors during this weekend, finding a room can get tricky really fast. Our recommendation is to book next year’s room well in advance. Once again the iModeler team will show up in force, with @editor, @halvarvonflake, @magnusf and @raikisan holding the community’s banners high. Apart from photographic documentation and news updates there will be plenty of time to have a chat with fellow iModelers – so make sure you drop by at our booth on UFM Arena’s ground floor! Can I buy an iModeler t-shirt directly from your stand at Moson? @bogdan_ionete no, sorry. With the large number of combinations (sizes, colors, motifs) we would have to bring a whole truck 🙂 Have you tried the online shop? No problem, I understand. I will visit your e shop. I can’t wait… this is by far the best modelling contest in Europe. Not to mention the opportunity to meet the Imodeler team. On the wishlist. Some modelfriends will travel this year to Moson, so maybe next year I’m traveling as well. Have a great show Boris!